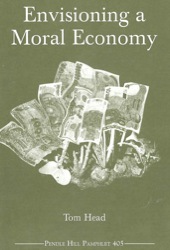 What is the place of moral values in the way we structure our economy? Should the teachings of Jesus and other faith traditions be considered when we address such questions as: How is work fashioned? Where do we live? What do we own? Quaker economist Tom Head explores how we might think about our economy–and its purposes–in new ways by including religious sources of wisdom and morality in our vision of a just and humane economic future. Tom Head is professor of Economics and chairperson of International Studies at George Fox University in Newberg, Oregon, where he has been on the faculty for over thirty years. During these decades he has also been actively involved with unprogrammed Quakers in Portland, Oregon, first as a member of Multnomah Monthly Meeting and more recently as one of the founding members of Bridge City Friends Meeting. He is nourished by the challenge of finding theological and spiritual common ground between divergent groups, Quaker and otherwise. He has a passion for interfaith work and has had a longstanding interest in the integration of religion and economics. In pursuit of putting faith into practice, he has been actively involved with a number of Quaker NGOs, including the Quaker Institute for the Future, the American Friends Service Committee, and the Quaker United Nations Office, serving as a delegate for QUNO to the World Trade Organization’s Sixth Ministerial Conference in Hong Kong in 2005 and the United Nations International Conference on Financing for Development in Monterrey, Mexico, in 2002. His pamphlet Envisioning a Moral Economy grew out of his November 2008 Pendle Hill workshop on the same theme and the July 2009 Quaker Institute for the Future Summer Seminar held at the Pacific School of Religion, Berkeley, California. Tom is grateful for the contributions of the participants in both of those events, and he welcomes reader feedback and ongoing conversation at thead@georgefox.edu.